According to owner Jed Clark, Little Bear Bottoms is a redneck’s Halloween. Clark said the location started out as a sod farm and they grew corn as a rotation crop to sell to a local dairy farmer for his cows. Eventually, the dairy farmer sold his cows so the Clark family had to find an alternative use for their corn crop. “We went through our options and basically, a corn maze is what we came up with,” Clark laughed. In the nine years since the corn maze started, they’ve also added the Spooky Barn Ride and the Haunted River Trail. The Haunted River Trail began after the Clarks bought the land neighboring them along the river. “When we bought the land, there was quite a bit of a farmer’s collection. Most farmers don’t throw anything away because they usually end up maybe needing it,” Clark explained. So he decided to use the collection of old things to create the Haunted River Trail. 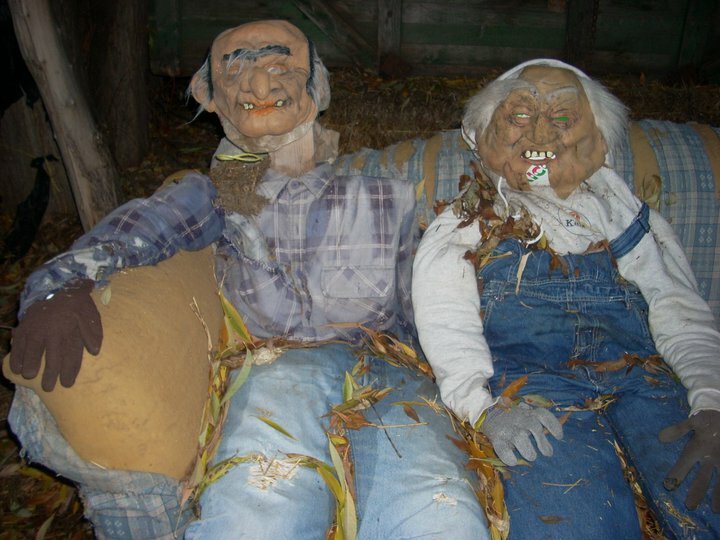 A more kid-friendly activity at Little Bear Bottoms is the Spooky Barn Ride. The wagon ride lasts for a half hour and scarecrows surrounding the barn play tricks on the guests. During the ride, the wagon driver tells stories about the pesky scarecrows. Little Bear Bottoms is open Monday-Thursday from 5 pm to 10 pm, Friday from 5 pm to 11 pm and Saturday from 1 pm until 11 pm. The Spooky Barn Ride runs on Monday, Fridays and Saturdays. The Haunted River Trail is open on Fridays and Saturdays. The cost of the corn maze is $6 for adults, $5 for students and $4 for children. The Spooky Barn Ride costs $10 for adults, $9 for students and $8 for children. A ticket for the Haunted River Trail is $7. Package deals are also available. Little Bear Bottoms is located at 5000 S Hwy 89 in Wellsville. Scott Huskinson owns the building that once housed iFrogz Inc., a company that produced protective cases, headphones and earbuds for mobile devices. “We’ve had people lease the front, so the question came up of what we were going to do with the back warehouse,” said Huskinson. That phone call occurred just two months ago, so father and son quickly got to work on their endeavors. While it’s only the first year for the 10<sup>th</sup> West Scare House, Huskinson said he’s been pleased with the turnout. The Scare House takes place inside a warehouse where small groups make their way through a maze. There are then two acres of trail that lead outdoors, so guests should dress accordingly. Huskinson added that they want this to be a place where friends and family can come and have fun. Tickets for the 10<sup>th</sup> West Scare House are $10 and on Thursday nights, a portion of ticket purchases will go to charity. On the 17<sup>th</sup>, donations went to Cache Valley for Hope. Tonight, the 24<sup>th</sup>, donations will go to the Child and Family Support Center. Next Thursday, on Halloween night, proceeds will go to Cache Valley ALS. The 10<sup>th</sup> West Scare House is open Thursday-Saturday from 7 pm until midnight. They are located at 900 N 1000 W in Logan. SHX is another brand new attraction to Cache Valley. Owner Karen Higley said it’s getting busy and they’ve had lots of people come back numerous times. “My husband and our partner’s husband have both always wanted to do some sort of a Halloween thing. They just got together and started thinking of ideas,” Higley said. The ideas they came up with were Alone, Bats, Pumpkin Launchin, and Mini G.
Alone is SHXperience’s haunted house and Higley said it’s really cool if you dare to go alone. To start the experience, you choose from four coffins. You are then trapped inside the coffin for about two minutes and then exit a different way than you went in. Higley said there is also a clue in each room to help individuals escape. Once you exit the room, you will then enter the haunted house. Bats is a laser game where you shoot at bats and rats with laser guns. There is also the indoor Pumpkin Launchin. Higley said there are several different launchers where you can launch pumpkins at zombies. The last activity is Mini G, a 28-foot-long trailer turned into a laser maze. SHX is open Tuesday-Thursday from 6 pm until 9 pm, and Fridays and Saturdays from 6 pm until midnight. Alone costs $10, Bats costs $5, Pumpkin Launchin is $1 per pumpkin, and the laser trailer is $3. Package deals are also available. SHXperience is located near Cox Honeyland at 700 W 1700 S in South Logan. Riverdale Resort is located just six miles north of Preston, Idaho. For the first time, the resort is hosting a Halloween attraction and calling it Dark Meadows Manor. Argyle claims that Dark Meadows Manor is unique because not only do they have a haunted house to go through, but swimming in the hot mineral pools is available and a mini carnival is also set up for the Halloween holiday. The carnival includes rides like a scrambler, rollercoaster and several attractions for children. Argyle said that many people who come out, say the haunted house is one of the scariest they’ve been through. It probably helps that several staff members have experience when it comes to haunted houses. One staff member did the Dark Meadows Haunted Forest and Manor at Sherwood Hills in the past and another has been involved with haunted attractions in the Bountiful area. Cost for the haunted house only is $10 or $15 for haunted house and swimming. The carnival rides are a dollar per ticket or an unlimited carnival pass is available for $12. For haunted house, swimming and unlimited carnival, the cost is $25. Argyle said they are always looking for volunteers to help with Dark Meadows Manor. “We like to have about 30 volunteers to keep it running smoothly every night. Anyone that wants to come and help will get free swim passes in exchange,” she said. Those interested in volunteering can call Riverdale Resort at (208)852-0266. Dark Meadows Manor is open Monday-Saturday at dark up until November 2<sup>nd</sup>. They stay open on weekdays until 10 and go until midnight on weekends. The address is 3696 N 1600 E in Preston, Idaho.